To settle dispute between two brothers fighting over an agreement which eventually is going to decide, who will get richer and who will get poorer? To bring someone to justice, who is desperately trying to divide and disintegrate the nation? Use your sense, common sense or whatever you have right above your neck. Done? Now let's find out the answer. In India, to settle dispute between two warring brothers is having lot more priority than to protect national integrity and to save our national from being taken for a ride. Mukesh Ambani and Anil Ambani are fighting over an MoU signed between them deciding pricing of the gas, which Mukesh is going to sell to Anil. The case is being fought in the Supreme Court, the highest court in India and they had / have almost daily elaborated hearing in the Supreme Court. On the other hand, we have Raj Thakre – I don’t think there is any need to write about what he has done and is doing to this nation. Someone who is hell bend upon destroying integrity of India’s truly cosmopolitan face – Mumbai. Congress, without any doubt, is hand in glove with Raj Thakre. After all, it’s helping Congress to kill Shiv Sena without any effort! That’s why Congress government in Maharashtra has been so soft on Raj Thakre that despite spitting venom – day in day out, he is virtually roaming scot free, even till date. Now today while browsing Internet, I read an interesting headline : “Charge sheet filed against Raj Thackeray for assaulting North Indians”. I felt DAMN happy that at least, at last, he will face the court. Did you read? The next hearing is on September 13, 2010!! Yes, our court does not have time to hear a case which has direct impact on India’s integrity. Even though its risking image of Mumbai, which has been a truly cosmopolitan city – until one fine day, Raj Thakre got brahma gyan about using Marathi manoos for his personal gain. Yeah but meanwhile, our supreme court will be very busy to decide which brother should get richer and which one should get poorer. Is that a bloody joke??????? However, what all these two words carry? Well, it carries history of thousands of years and faith of millions of Hindus across the globe… As per Hindu belief, a dip in Ganga and you can get rid of all your sins! BTW, it’s not Ganges. It’s Ganga. By any means, Ganga is not a difficult world to pronounce. Whenever I read the word “Ganges”, it feels like a derogatory term to describe Ganga Maiya. It’s still okay if foreigners use that word. However, I am pissed off when Indian writers use that word for the articles which are meant for Indian newspapers. Come on! We all know and love the word Ganga. So stop Ganges and let Ganga flow! To meet Ganga Maiya, I am visiting to the oldest city on this earth – Varanasi. Varanasi is the oldest city on this earth. Here is what Mark Twain mentioned about Varanasi (also known as Benares) : "Benares is older than history, older than tradition, older even than legend, and looks twice as old as all of them put together." As per Hindu belief, Varanasi is the center of the universe. It will be a great combination to be at Varanasi and to see, feel, touch water of Ganga. I know it may be dirty at places but still, as we all know, Ganga has a very special place in our heart. So starting from Saturday (5th November) , I will be in Varanasi for 3 days :). It will be my first real experience to see life of Uttar Pradesh. I will also visit Sarnath, which is just 10km away from Varanasi. Sarnath is sacred place for Buddhist. After that, I will spend one day at Ayodhya visiting all the historical places which we know through Ramayana. WOW! The traveler in me is very excited! It’s 4.40pm on Thursday evening. I will leave in next half an hour. Warangal to Varanasi by train – 30 hours! Will keep you posted through Facebook. I love India. You love India. We love India. However when yours and mine grandfathers were born, there was no India. There were 550+ states with 550+kings having their own identify, boundaries, flag, railway line and even currency. Then who brought these kingdoms under one umbrella and gave us identity as a nation? Well, we owe our existence as a nation to one man – whom most of us have forgotten. He was a true nationalist. However, he is sidelined and marginalized consistently. Because he cared more for the nation than his own personal image. Because he was more interested in building a nation rather than flirting with a viceroy’s wife. Because he dedicated his time to solve country’s problem rather than flying pigeons. Because he didn’t have Gandhi / Nehru as his last name. If you still couldn’t make out who I am talking about, then it’s not your fault. It’s bound to be when he is neglected outright – by his own party, by print and visual media, by those who write history books for schools. This is a very important milestone in Indian history. The architect of modern India was born on this day. 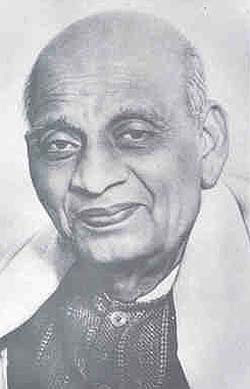 Yes, I am talking about none other than THE IRON MAN of INDIA - Sardar Vallabhbhai Patel. It’s Saturday in INDIA. Very same INDIA that was brought to existence by Sardar Patel. I am in front of TV most of the time as it's Saturday. I see all the channels are going ga – ga over Mrs. Indira Gandhi, who had died on 31 October 1984. As if there is a competition (to please a particular party/clan), channels are going berserk to outdo each other by bombarding programs about her life, her great(?) work, her assassination, various interviews of her associates and what not! However, not a single channel dedicated even 5 minutes for the great man, who was born on very same day. And because of whom, we got our identity as a nation. Shame on them. Shame on us. As an Indian who still loves his country, I pay my sincere respect and express gratitude towards this great man. Hats off to you. If you had been the first Prime Minister of India, we would have been a very different (read “BETTER”) nation. A nation, a generation who cannot recognize and respect those who dedicated their lives for them, is surely on the path of self destruction. © Except picture in this post, all rights reserved with Mihir Rawal. To re-print or re-use, prior permission is required from the author.